Before it was the first-ever name of this website, “Immaculate Infatuation” was a made-up British rock band that my college friends and I dressed up as for Halloween one year. (Think Guns N’ Roses meet a British version of Motley Crue.) After the band retired, Immaculate Infatuation lived on as the name of my fantasy football team, and when Stang and I needed to figure out what to call our new venture, the choice was obvious. But before the Infatuation went live April 1st 2009, about a million other potentially genius plans were discussed. Thankfully, the initial idea of starting our own record label never materialized (that would have been a disaster), and our clothing line (called “My Future”) only wound up producing a single t-shirt. My point? All this talk happened somewhere, and more often than not, it happened at the Bistro. There’s something about pounding cheap beers and burgers here that makes you feel like anything is possible. When we finally decided it was go time for The Infatuation, we were sitting in Corner Bistro. Look hard enough and you’ll find it engraved in one of the back booths. That’s our Corner Bistro story, I’m sure you have your own as well. If these walls could talk, they’d give away all our secrets. 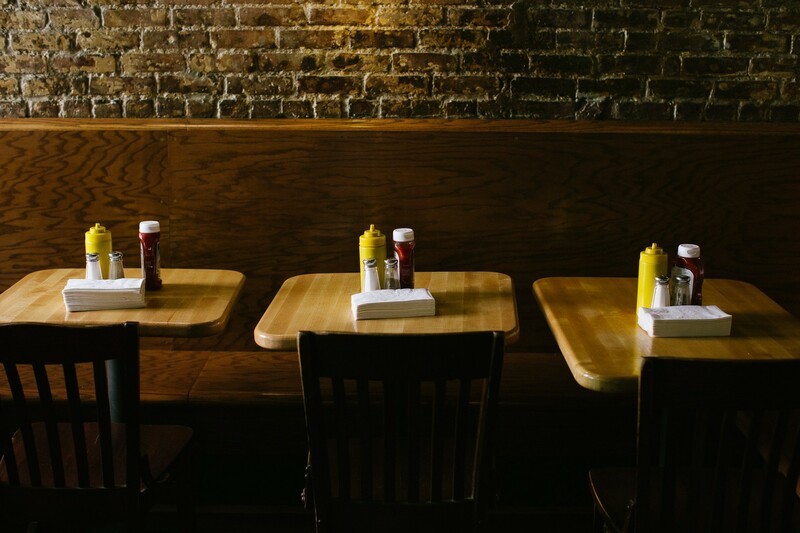 Before the burger craze hit this city like Cloverfield, the Bistro Burger was always considered one of Manhattan’s best. That hasn’t changed in our minds. The burger game may have become more competitive, but that doesn’t take away from this spot’s greatness. Without Corner Bistro, there is no Minetta Tavern Black Label Burger. Yes, there may be better burgers out there, but no better chomping ground to eat them. We’ve declared Shake Shack as the burger all other NYC burgers are to be measured, but Corner Bistro is the burger establishment all other NYC burger joints are to be measured. It’s straight-up chuck - dirty, greasy, massive, and delicious. A true classic and as New York as it gets. Don’t be shy, order your own. You’re not going to want to share these thin, McDonald’s-style salty potatoes. A friend of mine comes here all the time and only orders the Grilled Cheese. She freakin’ loves it, can’t get enough. If beef isn’t your thing, here’s another incredibly unhealthy option. Although I’ve never tasted it, I know people who have and back it. As down and dirty as the burger, but chicken. Now that the food and the crowd have improved for the better, Hudson Clearwater gets an improved rating, and more frequent Infatuation visits. Mister Dips is a little trailer in a Williamsburg park where you can pick up a burger, some ice cream, and a thing of waffle fries covered in cheese. Emmy Squared in Williamsburg is the adult version of your childhood pizza party dreams. Sometimes you don’t want brunch. Sometimes you want breakfast at noon. There’s a difference. La Bonbonniere is a Village safe haven from all things hollandaise, and one of the best true breakfast joints in town.